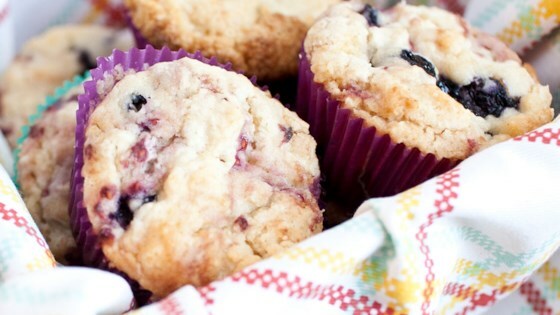 "These vegan muffins filled with blueberries and raspberries are the perfect baked treat." Sift flour and baking powder together in a mixing bowl. Stir in lemon zest and salt. Add softened vegan margarine, canola oil, sugar, vanilla and Almond Breeze Almondmilk Vanilla. Mix well. Fold in blueberries and raspberries. Pour into muffin tin, and bake at 350 degrees F for 25 minutes or until toothpick comes out clean. I agree with another reviewer who said the muffins turned out flat on top. Mine did too and I followed the ingredients and instructions exactly. They were tasty but did not rise at all. Love this simple recipe! Lemon zest is the key to being out the sweetness in this recipe. The almond milk makes it surprisingly moist! Will definitely be making this a lot! Very good. Just used a cup of blueberries since I didn't have raspberries. Also used soy light vanilla milk since I didn't have almond milk. My daughter and i really liked these. We added about half the oil and made up the other half with applesauce. They are a bit lemony and for my husband too fruity...but hey, that's what they are!